SETF understands that peace is impossible without justice. We strive to support documentation efforts of the war crimes carried out against the Syrian people. In our partnership with the Ceaser team and renowned experts of international humanitarian law, including the United States Holocaust memorial museum, US War Crimes Ambassador Stephen Rapp, and international lawyers, we pursue legal prosecutions of war criminals all over the world. We have been pursuing multiple prosecution efforts in Europe and elsewhere to bring cases against those guilty of war crimes in Syria. SETF helps document war crimes carried out by all sides against Syrian civilians. We are the custodians of the Caesar file detailing the torture to death of thousands of men, women, and children by the Assad government. SETF proudly works with the Caesar team to expose the regime’s flagrant human rights violations by holding powerful photo exhibits. Previous exhibits have been held at Congress, the United States Holocaust Memorial Museum in DC, United Nations Headquarters in Manhattan, Nobel Peace Center in Norway, European Parliament, UK parliament, and Universities such as Harvard, Princeton, Yale, and Georgetown. Through these photos we are also continuing to identify victims and witnessed to bring cases against the regime in countries that have universal jurisdictions or where victims may hold dual citizenship. The Caesar photos along with the cellphone and flash-drive used to smuggle the pictures out of Syria are on permanent display in the United Sates Holocaust Memorial Museum. 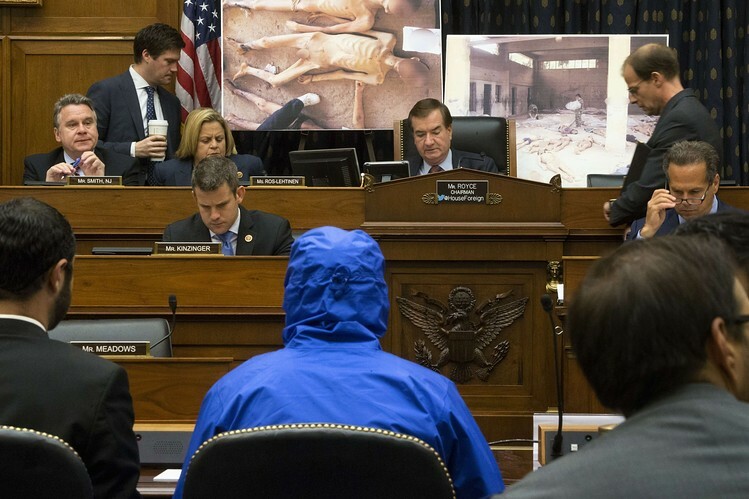 Caesar testifies before U.S. congress and displays images images of torture from the Caesar file (2014).